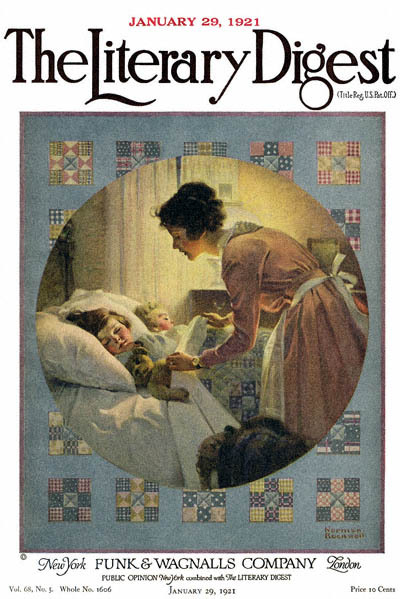 Mother Tucking Children in Bed, this Norman Rockwell painting, appeared on the cover of The Literary Digest published January 29, 1921. The alternate title for this work is Mother's Little Angels. This illustration was Rockwell's twenty-second picture featured on the cover of The Literary Digest. The Digest featured Rockwell artwork on the cover twelve times total in 1921 alone. A Rockwell painting appeared on the cover once each month in 1921. This painting also appears on page 54 of Norman Rockwell, A Definitive Catalogue by Laurie Norton Moffatt. This is one of the more popular Rockwell images to appear on the cover of the Literary Digest. Mother Tucking Children in Bed was only one of 47 Norman Rockwell Literary Digest covers; here is the list of more Norman Rockwell Literary Digest scans. Unknown to most is the identity of the model for Mother. In this painting, Norman Rockwell used his first wife, Irene Rockwell, as the model for the mother. Was this wishful thinking on his or her part? Their union produced no children. Mother is tucking her two little angels into bed. Rockwell painted most of his families as having both a boy and a girl. This family has both also. Both children appear to already be asleep. The little girl, with brown straight hair, is closest to us and is clutching her teddy bear. The little boy, with blonde curly hair, is asleep on the far side of the bed. Look closely and you will notice that the quilt on the bed matches the quilt that frames the picture. Knowing Rockwell's penchant for authenticity in detail as we do, he probably commissioned a quiltmaker to make this prop.